What is this odd, yet intriguing combination of ingredients, you might be wondering. Well, it's a classic straight from the chili parlors of Ohio. A chili meat sauce served over pasta, topped with cheese and onions. Traditionally, Cincinnati Chili contains a myriad of unexpected ingredients - cinnamon and cloves, vinegar and molasses, and even chocolate. The first time I made it, I tried it with the works. As it turned out, though, I and my family like it best with the a few of the spices omitted. The recipe below is for the chili as I like it best, but included are measurements for the missing ingredients, so make it either way - or try both! This recipe is adapted from Leite's Culinaria. It is a fairly simple recipe. It's flavorful and unique, and most importantly, really good. The list of ingredients may be odd, but they totally work. You don't have to serve it over pasta, of course. Hot dogs make a great canvas, too. Give it a try! 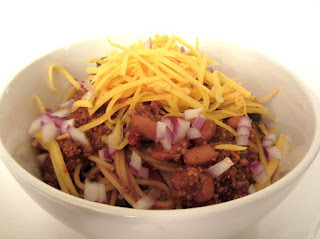 *Traditional Cincinnati Chili contains a few additional seasonings: 1 tsp ground cinnamon, 1/4 tsp ground allspice, and 1/4 tsp ground cloves. My family very much prefers this recipe without those spices. You might want to give them a try, though. You could divide the sauce in half and add 1/2 tsp ground cinnamon, 1/8 tsp ground allspice, and 1/8 tsp ground cloves to one half and try it both ways. *This recipe can be made with ground beef or turkey if preferred. 1. Combine the minced onion, ancho powder, cocoa powder, paprika, cumin, salt, black pepper, and oregano in a small bowl. Stir to combine. Set aside. 2. Heat 1 tbsp of the oil over high heat in a large high sided skillet or dutch oven. Once hot, add the ground chicken. Cook, crumbling as you go, until the meat is completely cooked through. Remove the pan from the heat. Add the spice mixture and stir to combine. Allow the meat to cool slightly. 3. Pulse the meat in a food processor until well crumbled (but not pasty). Set aside. 4. Heat the remaining 1 tbsp of oil over medium-high heat in the same pan. Once hot, add the green pepper and garlic. Cook, stirring often, until the green pepper has softened. 5. Add the tomato sauce and water to the pan. Stir to combine. Reduce the heat to a simmer. 6. Stir in the bay leaf, cider vinegar, and molasses. 7. Pulse the diced tomatoes in a food processor until cut into small pieces. Add the tomatoes to the pan. 8. Simmer over very low heat until the meat is very tender and the mixture has thickened a bit (should end up the consistency of a ragu) - about 30-45 minutes. Add the beans, if using. Keep warm. 9. Cook the pasta according to package directions. Drain well. 10. Toss the pasta with 1/3 of the sauce. 11. Serve the pasta topped with additional sauce, cheese to taste, and red onions to taste.